Beyond that, our interests in Ireland were as varied as our ages. Our adult son was into Irish music, our daughter into museums and historical sites and our son-in-law believed pub-crawling was an integral part of Irish culture and needed to be explored. The only one with an open mind, bless him, was the 11-year-old grandson who was up for anything and didn’t realize how many of the “Star Wars” movies had been filmed in remote Irish locations. It fell to us, the septuagenarians, to plan a seven-day trip that would accommodate everyone’s interest while getting to see a good bit of the country. We chose a self-drive road trip with flexible accommodations and with the help of the Irish, we actually managed to do it. Our planning for this multi-generational travel experience had started months before when we contacted Sceptre Tours. We were responding to an ad for off-season travel to Ireland at an incredibly attractive rate. Opting to go instead in the busiest high season, we paid more than was advertised of course, but the efficiency and amenities provided by the people at Sceptre more than made up for it. In no time at all they had booked our space with Ireland’s premier airline, Aer Lingus. We pored over a road map, studied guide books, talked to friends and gained a consensus among the family members (always a challenge!) as to where we should go. Then we made our B&B reservations. Necessary in August/September we thought, not so perhaps at other times of the year. Because of the disparate interests and ages being considered, we took the Chinese take-out approach. We chose three towns from column A, two from column B and added the Beara Peninsula and the city of Dublin as overnight stays for everyone. Heading south from Dublin down the N11 (main roads carry the “N” prefix) we got tempting glimpses of the Irish Sea and detoured to drive through the old port town of Wexford with its quaint waterfront and winding streets. But the primary destination on our jet-lagged first day was Waterford, home of the glass factory whose products are one of Ireland’s most visible exports. Highly organized to cope with an endless flow of tourists, the factory staff lead interesting tours which show an ancient craft still practiced much as it has been for generations. To watch the craftsmen at work, from the raw materials to the finished, polished, gleaming crystal (including famous trophies such as the NFL Super Bowl prize) made the visit, voted for principally by our grandson, a very worthwhile stop. Tramore presented our first B&B experience, at the charming The Cliff House. It is a popular coastal resort town with a wide range of recreational facilities and, in summer, a traveling carnival with midway rides set up near the beach. Celtworld, an indoor attraction opened in 1992, is focused on modern technology to inform visitors on the myths and legends of the Celtic peoples in an entertaining way. Good to remember for a rainy day. Day two took us westwards towards Cork. This journey was punctuated by an extended stop at the historic Ballymaloe House for lunch. We had e-mailed them for reservations prior to arriving in Ireland, and appreciated their thoughtful advice to skip the famous multi-course supper when dining with children under 16 years. 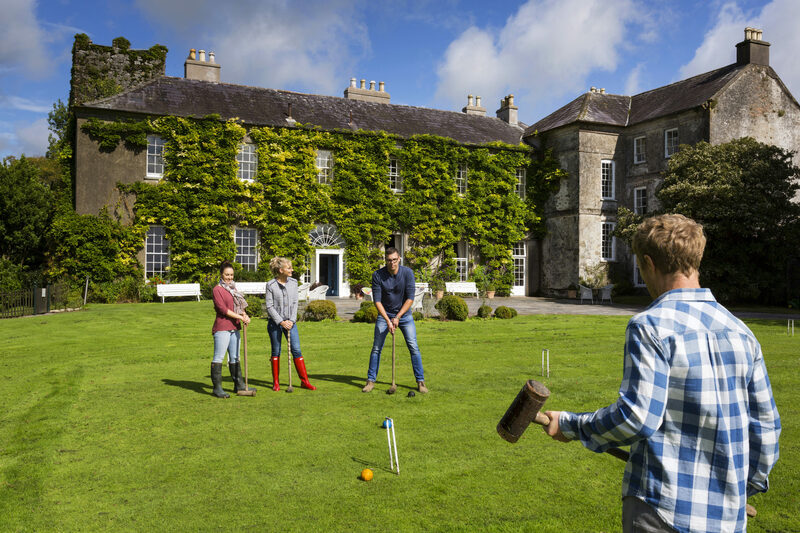 Set in 400 lovely park-like acres near Shannagarry, this picturesque country inn and its highly regarded cooking school and chef (Ireland’s Martha Stewart) provided a delightful afternoon. After a sensational lunch we all repaired to the garden for coffee, and enjoyed a new experience — croquet on the lawn, before moving on. Deciding to by-pass the heavily tourist-trafficked city of Cork and (by majority vote) the famous Blarney Castle, we crossed the Cork Harbor inlet at Crosshaven and took a car ferry to the western shore; a scenic and relaxing way to go; a pleasant shortcut to Kinsale and our next B&B. Kinsale, a favorite destination for the Irish as well as for foreign visitors, is charmingly set into steep hills overlooking the River Brandon estuary. A working fishing port, better known these days as a yachtsman’s haven, Kinsale retains much of its early charm with colorful painted houses and narrow streets. As one journeys farther west and southwest, the scenery changes. 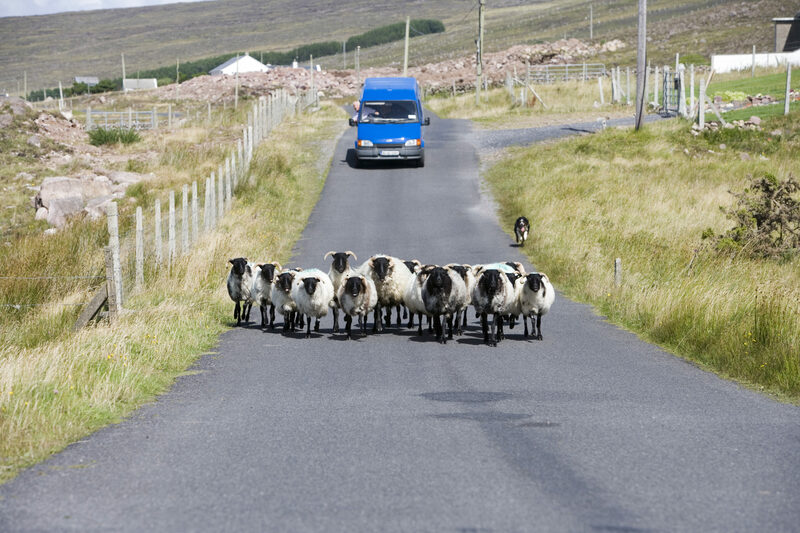 Ireland’s wooded hills give way to grazing black-faced sheep in rock strewn pastures bounded by dry stone walls. The beaches become rocky inlets and all but the main roads narrow to the point where two vehicles have to choose quite carefully where to pass when they meet! This scenery is on a grand scale. It is Ireland’s Atlantic coastline. Driving over the Caha Mountain range north of Bantry Bay, the roadside restaurant at the head of the pass was a paradigm of Ireland’s tourism. Hikers, bicyclists and motorcyclists rubbed shoulders with the different nationalities spilling out of tourist buses, while the cars in the parking area carried license plates from all over the European Union. Although it was a modest roadside restaurant the food, like almost everywhere else we stopped, was delicious. Downstairs there was an Avoca shop specializing in hand-made Irish knitwear at surprisingly good prices. Everyone in the family bought something. Our next stop, the town of Kenmare, winner in 2000 of Ireland’s annual “Tidy Town” award, is prettily situated at the outflow of the River Roughty at the head of a long inlet from the sea. A well-planned town dating from 1775, it is a good place to stay to take in the Ring of Kerry and the less touristy but equally scenic one-day circuit of the Beara Peninsula. Kenmare has its own archaeological interests, a Druid Circle (a ring of standing stones), as well as a now derelict abbey, which inspired the name of our “home” that night. The Abbey Court B&B is a stone property developed by the enterprising Ceallaigh family (can you believe this is the Gaelic spelling for Kelly? ), whose hospitality was typical of our Irish experience. Not only here, but everywhere we stayed, the famous Full Irish Breakfast became a daily habit for most of us! None could resist the all-inclusive menu of juice, fruit and cereals (hot or cold) followed by a plate of the renowned, lean Irish bacon, surrounded by eggs done “just how you like them,” mushrooms, black and white sausage, grilled tomatoes, served with toast and marmalade and a bottomless pot of tea or coffee. And, “would there be anything else you’d like” as the meal progresses is a genuine offer of “second helpings” topped off almost always by a warm and engaging conversation with the owners. B&Bs are far more than a cottage industry in Ireland. They are part of the fabric of the country. To round out the trip we all opted to dine at a few grand manor houses as an adjunct to the B&B experience. In Kenmare, the well- known Park Hotel Kenmare offers deluxe accommodations, facilities and service, but it is in the restaurant that the Park Hotel excels. We were treated to an exquisite anniversary dinner, tastefully presented in quiet, elegant, castle-like surroundings. We trust the resident hotel guests were as pleased with their dining experience as we were with ours. The price (in Euros) was about equivalent to a meal in a top New York restaurant, but the ambience and the food were a world apart. This dinner was in a class by itself. The Lakes of Killarney, set in green wooded hills, provide yet another change of scenery en route to the Dingle Peninsula. Try as we might, we couldn’t find a way, in such a tight itinerary, to be in Tralee on a Saturday afternoon for the Classic Races at Ballybegan Park. Tralee is also one of several small towns with fun indoor aquadomes for water play year-round. We consoled ourselves with the notion that you can’t do everything and piled back into the van. We’ll just have to come back! 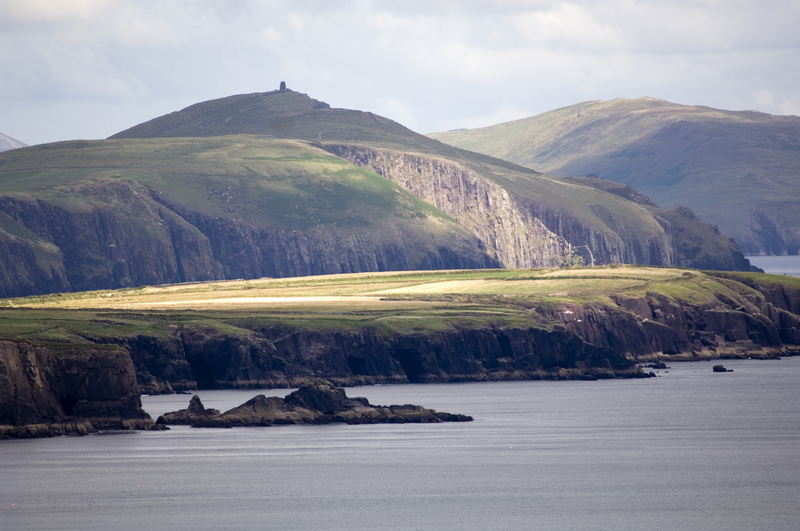 The publicity for Dingle makes the claim that it is “the most westerly town in Europe.” Hugging the south coast of the peninsula, the road to Dingle skirts the long white sand beach near the resort town of Inch. On the one side the green hills, on the other the sea, sparkling in the late afternoon sunshine. We took a break to stop and watch families doing the things families do at beaches the world over. Kids playing in the water, parents under umbrellas shielded from the breeze, body-boards being put to good use and everywhere – on a blanket or tailgate – a picnic in progress. But Dingle beckoned. A picturesque commercial fishing port with brightly painted houses, winding streets and a plethora of shops and restaurants, Dingle is a fine base from which to explore the several ancient sites at the western end of the peninsula. Add a day-trip by boat to the Blaskett Islands, weather permitting, from the harbor at Dunquin and visit the National Historic Park. The islands are now uninhabited, but in 1588 one of the ships of the Spanish Armada ran aground there leaving an indelible mark on a famous page of history. Dingle offers a wide variety of restaurants, excelling in local fresh seafood as one would expect. Fenton’s was recommended to us for its superb food served in a charming, bistro-like atmosphere. Located right in the center of town, Fenton’s is one of Dingle’s treasures. We were adopted by the staff and patrons and left with a whole new circle of friends and a belly full of elaborate desserts. Leaving Dingle we had to choose a route. We could take the “fast” road east, going back the way we had come, before heading north and east towards Limerick, or the “scenic” and much more rewarding route over the Slieve Mish mountains to the north shore of the Dingle Peninsula and thence via Tralee to other points farther north and east. The latter is the choice to make if you have the time. The temptation to linger had to be resisted, so we headed directly for Adare, some 9 miles south of Limerick, and our next B&B. With its thatched roofed cottages along the main street, boutiques and gardens, Adare could have been lifted from somewhere in the English countryside and planted in Ireland. In fact, while much of the architecture is owed to construction by one of the Earls of Dunraven, the area was settled in the 18th century by refugees from the Pfalz region of Germany. The River Maigue is crossed by a stone bridge with 14 arches while the extensive ruins of Desmond Castle (13th century) are a short walk away. The former seat of the Dunraven family, now Adare Manor, a luxury hotel and restaurant, stands in large grounds on the edge of the village together with the ruins of a Franciscan friary and a championship golf course. The Irish PGA tournament had been held there the week before. Here we contrasted our B&B experience with a superb dinner at the Adare Manor, overlooking the river as it winds through the park and gardens, itself an attraction in trout season as a fine fly-fishing experience. And so to Dublin, by way of the cross-country “main” road, N7. But even now, we found reasons to pause along the way. There are so many interesting things to do and see in Ireland one needs to wander, not to rush. In the town of Nenagh, there is an early 13th century castle famous for its 100-foot-high round tower. Farther on, Roscrea got our attention. Another small town full of historic buildings and a church dating from the 12th century built on the site of a 7th century monastery. Phew! One more stop en route to Dublin was Kildare. Here, since 1946, is the site of Ireland’s famous National Stud. Its facilities and museum, now open to the public, sit on 958 acres of land originally purchased by an eccentric member of a wealthy Scottish family who was determined to raise thoroughbred horses. A bonus in visiting the Irish National Stud is that it adjoins the wonderfully tranquil and completely authentic Japanese Gardens. Proclaimed the “finest Japanese Gardens in Europe,” they were laid out by a local (Japanese) gardener and his son over four years, completed in 1910 and today challenge visitors to follow the 20 stages of “The Life of Man” with a poetic brochure and map guiding you through an astonishing landscape of bonsai and Asian flora. Sceptre Tours’ “Emerald Classic” self-drive programs from Shannon or Dublin allow families to stay in a hotel, manor house or castle for a modest extra sum in addition to the B&Bs in its basic tour program. In Dublin we were assigned to the Jury’s Hotel in Ballsbridge, one of a long established chain of Irish hotels. They treated us kindly and efficiently and provided no surprises other than the free parking for resident guests. Try that out the next time you stay in a capital city hotel! Our two days in Dublin were crammed with things to do, ranging from the (almost) mandatory visit to the Guinness factory to Trinity College with its famous library and the quite wonderful exhibition of “The Book of Kells.” We caught “Ragus,” the Irish music of an Arran Islands group and saw step dancing at the old Olympia Theatre, then hit the late night pubs in the Temple Bar district for people-watching and (of course) our personal contribution to keeping both Guinness and Midleton Irish Whisky in business. During the day we toured Grafton Street, the pedestrian mall filled with trendy shops and restaurants. A stop at the landmark Bewley’s Tea Room, just reopened after a big renovation, proved to be an ideal place for afternoon tea to watch the world go by. Did you know the Irish drink more tea per capita than any other country in the world? It’s such fun to be among the Irish in Ireland. In the department stores, the restaurants, the taxis and every other place, the Irish embrace visitors and make you feel completely welcome. With a heavy heart, fond memories and a bag full of souvenirs (despite the effects of the Euro versus a less-than-strong dollar), we boarded our Aer Lingus flight for the return trans-Atlantic crossing. Our self-drive vacation followed an itinerary which can easily be booked through Sceptre Vacations. To benefit from experience, choose from the recommended B&Bs and take advantage of great prices. On another note, this trip requires a certain amount of driver fortitude. Our previous Europe travel experience and Ireland’s quiet roads made several family members comfortable driving on the other, or left side of the road. However, those who feel more comfortable leaving the driving “to them” may consider adding a licensed Irish Guide/Chauffeur to your family party. Check with Sceptre Tours about current rates, and be sure to notify them when making your reservation if you will be requiring a carseat, booster or any other special need. 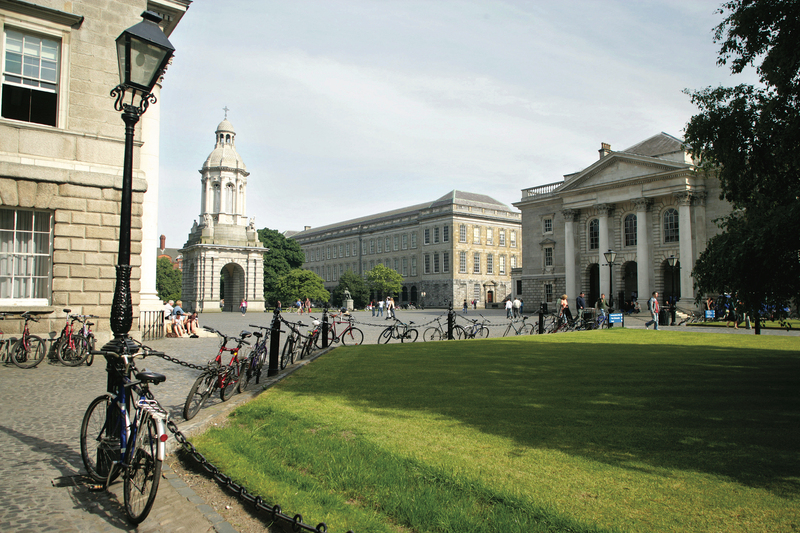 For general information and trip planning, Tourism Ireland, the tourist office site is extremely helpful to visitors. Once you’ve reached the Emerald Isle, the local branch of the Irish Tourist Office or Failte Ireland (failte, pronounced FULL-shuh means “welcome”) will assist you by offering guidance to both the southern and northern parts of the country through their many regional offices. May the luck of the Irish follow you on the road. This sounds like such a fun trip, but do you think it would be hard to drive a minivan full of kids for us, since it’s on the “wrong” side of the street in Ireland? I wonder how much traffic there is and how stressful this would be, with parking, filling up the gas tank, etc.